Simmonds Precision Products (bought by Goodrich), a company in Vergennes, Vermont, which I worked for for a couple years prior to quitting to attend the University of Vermont full-time to finish my electrical engineering degree, had as one of their main products capacitance-based fuel measurement systems for military and commercial aircraft. As was common in the era (up through the late 1980s), they made not only the capacitance probes and associated electronics, but also the cockpit displays and power supplies. Being a test technician at the time, I got a pretty good exposure to the complexities of such a fundamentally simple principle as using the dielectric constant of the fuel to vary the capacitance between a set of plates. 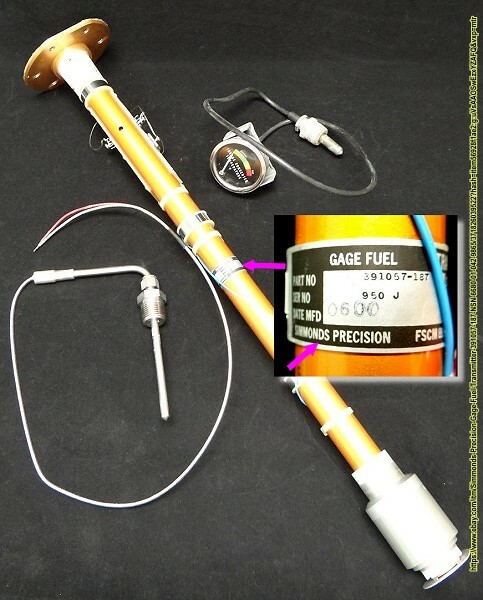 Capacitance probes were located at strategic points inside the fuel tank such that, combined with other flight parameter data (pitch, roll, yaw, acceleration, etc. ), yielded an accurate [enough] indication of the fuel quantity. The cockpit displays were transitioning from a mechanical indicator to LCDs, which were very new and very expensive. I got to use a photometer setup for the first time to measure brightness and contrast, and also the first ESD protection test setup to validate immunity to static discharges of the display. Much of the test equipment was custom designed in-house as well (not the photometer). 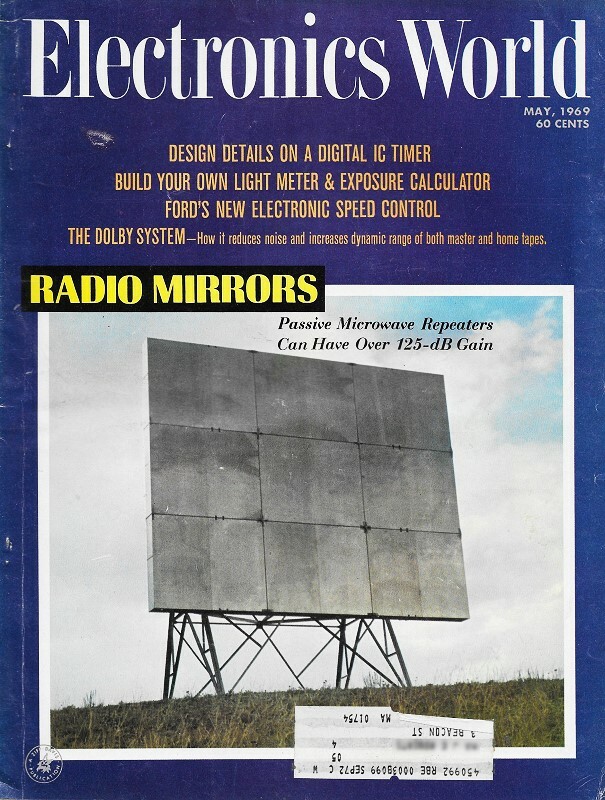 By Ray A. Shiver / AiResearch Mfg. Co.
Super-precision tolerances required in making and testing today's planes and space vehicles are checked with these probes. These techniques are described. Fig. 1 - (A) Differential-transformer and (B) FM capacitance-probe methods have the disadvantage of temperature problems. Today's aircraft and space industry requires super-precision tolerances in the manufacture and testing of components. This applies to dynamic testing and balancing, as well as precise static measurements. Dynamic measurements require that readings be taken while the test specimen is in motion, such as shaft balancing on an engine or displacement readings on a vibrating member. Static measurements involve setting precise distances between two members which are stationary at the time of installation or adjustment. Today's instruments can accurately measure distances as small as 50 microinches. Included in this article is a description of one such system that is capable of producing excellent accuracies within the range 0.00005 to 0.5 inch. Several methods have been employed for measuring distance (or proximity) and each will be discussed briefly. The setup illustrating a variable-reluctance differential-transformer system is shown in Fig. 1A. An a.c. voltage is applied to the excitation coil as indicated. The two secondary coils, L1 and L2, are connected so that they are 180° out-of-phase and no voltage is present at the output terminals. The resistive and capacitive balance is necessary to cancel out small differences in the inductance of L1 and L2 and to provide a means of adjusting for zero output voltage at various positions of the metallic object in relation to the differential transformer probe (core). The system is first balanced with the metal object in some rest position. Any movement away from this position will change the inductance of L1 with respect to L2 and an unbalance voltage will be present at the output terminals which is proportional to the distance traveled. Thus, such a system is useful for measurements involving vibration and displacement. There are two disadvantages of such a system. First, the operating range, in order to be linear, is necessarily limited to a few mils (thousandths of an inch) and, second, the accuracy suffers markedly with any change in temperature at the probe location. This shows up very noticeably as a shift in the original balance position and a loss of the zero reference point. The variable-reluctance system produces very good results over a limited operating range if the temperature at the measuring location remains constant. Fig. 2 - (A) Feedback-loop capacitance-probe system produces output inversely proportional to C2. (B) Probe construction. 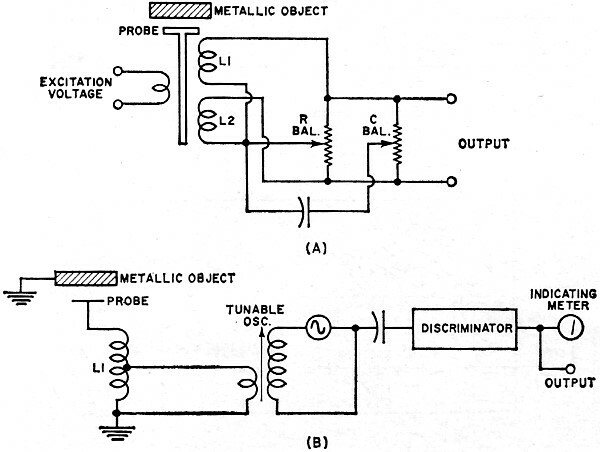 A system employing a tunable oscillator, discriminator, and tuned pickup coil is shown in Fig. 1B. The operation of such a system is as follows: With the metallic object at some rest position, the oscillator is tuned to the discriminator frequency, producing a zero output voltage. Any movement of the object away from the original position produces a capacitance change across L1, thereby causing the oscillator frequency to shift a proportional amount. 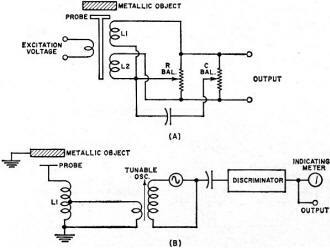 The discriminator circuit in the measuring instrument produces a corresponding output voltage. Usually included with such an instrument are a meter that can be calibrated directly and an analog d.c. output voltage for use by recording devices or other measuring instruments. This system for measuring distance is capable of good operating range and frequency response. However, it suffers one drawback that is common to the first system in that it is quite temperature sensitive. Fig. 3 - Additional circuits needed for distance measurements. This method overcomes the temperature problem associated with the first two systems. Fig. 2A illustrates the basic circuitry for an inverse-feedback capacitance-probe system. The voltage from a high-frequency oscillator (usually 50-100 kHz) is fed to the input of a high-gain amplifier. The output voltage, Vo, is 180° out-of-phase with the input voltage, Vi, and is coupled to the amplifier input through C2, which completes the feedback loop. This capacitor represents the remotely located probe and test structure, with one plate the capacitance probe and the other the metallic test specimen. The amplifier output voltage is inversely proportional to the capacitance of C2 (capacitance between probe and test structure ). Hence, a voltage, Vo, is produced whose amplitude is directly proportional to any change in distance between the probe and test structure. Fig. 2B shows the construction of a typical capacitance probe used with a feedback-loop measuring system. The cross-section shows the button (active probe surface), insulator, guard shield, and body of the probe. The center button is connected through a shielded cable to the high side of the amplifier input. The guard shield effectively eliminates any stray capacitance pickup at the sides of the probe and confines the active surface to the front of the center button. The test structure and one side of the amplifier output are connected to ground through a separate ground-return line. Fig. 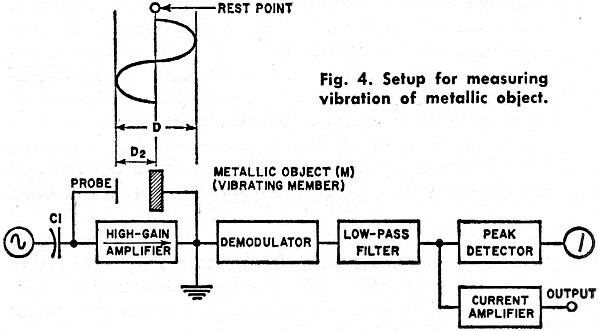 4 - Setup for measuring vibration of metallic object. 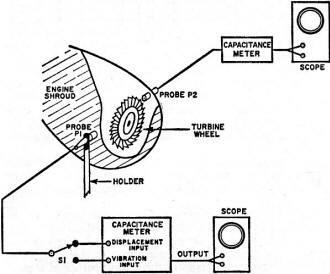 Vibration is measured by the capacitance-probe system, as shown in Fig. 4. The vibrating member (M) begins at a rest point and oscillates through a total distance (D), producing a peak-to-peak sinusoidal wave as shown in the diagram. The signal is then fed to the demodulator as indicated. A rectified signal whose amplitude is directly proportional to the displacement we wish to measure (D2) is produced at the demodulator output. The signal is then amplified by the current amplifier where it may be displayed on an oscilloscope or used to drive suitable recording devices. If an indicating meter is used, a suitable peak-detecting circuit is employed. The damping characteristics are such that the meter indicates true displacement (D2) between the capacitance probe and the vibrating member. It is often desirable to express vibration in terms of acceleration (G forces). This is especially true when the frequency of the vibrating structure encompasses a moderately wide range. A setup that will readily determine the G forces present makes use of a scope and a digital frequency counter. The signal from the distance meter is connected to the X-axis of the scope. A variable-frequency oscillator covering the appropriate range to be measured is connected to the Y-axis. The frequency counter monitors the oscillator output. In order to determine the frequency of the vibrating structure, the oscillator frequency is varied until a stationary circular Lissajous pattern is produced on the screen. 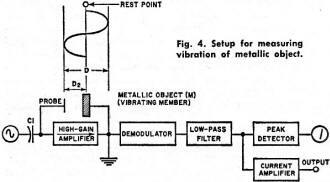 At this point, the oscillator frequency equals that of the vibrating structure and may be conveniently read on the digital frequency meter. With the frequency and displacement of the vibrating structure known, the G forces may be calculated using the formula: G = 0.0511Df2 where G = units of gravity (386 in/s2), D = displacement (p-p amplitude in inches), and f = vibration frequency in hertz. As a practical matter, hand calculators are available to derive this data, which eliminates the need for pencil and paper computations. Fig. 5 - Typical setup for static and dynamic measurements. Fig. 5 is a typical setup for both static and dynamic measurements, using capacitance probes. The cutaway drawing shows two capacitance probes mounted in such a manner as to read vibration, displacement, and thermal stress on a gas turbine engine. Probe P1 is mounted on a stationary member independent of the engine. Probe P2 is mounted on the engine shroud itself in such a manner that it sees the tips of the blades on the turbine wheel. In order to insure accurate data from the measuring probes it is necessary to provide an external calibration system for the operating range desired. To accomplish this, several calibration points must be provided between P1 and the turbine shroud, and P2 with relation to the wheel blade tips. The probes must first be loosened in their mounts so that there is sufficient freedom of movement for calibration purposes. Calibration blocks (similar to automobile feeler gages) are used to set the precise distances needed for calibration. Probe P1 would be calibrated in the following manner, assuming a d.c.-coupled oscilloscope is used as the readout device, as shown in Fig. 5. 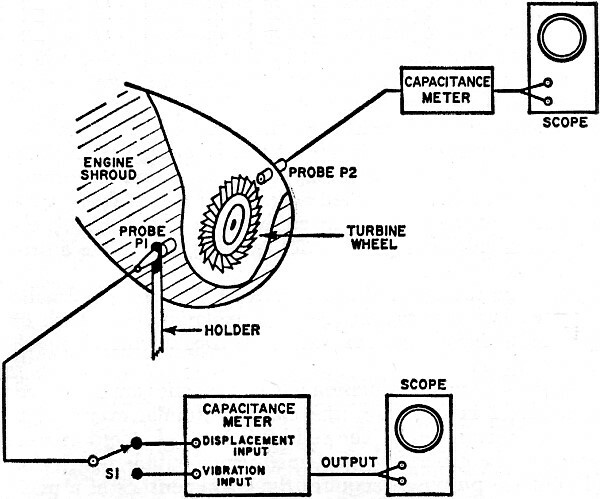 The scope is first balanced for d.c. usage (no deflection of the beam when the input gain is changed) and then the output of the capacitance meter is connected. A calibration block 200-mils thick is inserted between the engine shroud and the probe face. The probe mount is now tightened and the calibration block removed. The oscilloscope trace is placed on a conventional horizontal reference line using the beam-position control. Again the probe mount is loosened and a 210-mil calibration block inserted between the probe and the shroud. The probe mount is again tightened and the block removed. Assuming we wish to calibrate the scope for 2 mils per division, we would set the input gain until the trace moves up by 5 divisions. This procedure is repeated several times until good repeatability is obtained. After the calibration process is completed, the probe is placed at a convenient point from the shroud, at a distance not exceeding the linear operating range of the particular probe used. For small operating ranges (10-100 mils), feeler gages can be used for this purpose. Once this distance has been determined, the probe holder is tightened and the scope trace positioned on the reference line. The system is now ready for use. Probe P2 is calibrated in much the same manner except an inside micrometer is used to set probe distances since the tip of the probe is not readily accessible. Some possible test objectives for the example in Fig 5 would include: From probe P1 obtain the maximum vibration point in both displacement and G forces. Also from P1 obtain the maximum thermal growth of the shroud (expansion due to increased temperature). From probe P2 obtain the minimum clearance between the blade tips of the turbine wheel and the shroud. The tests would be run in the following manner. Switch S1 would be placed on the vibration input to the capacitance meter, since no thermal stress information would be needed until the unit had reached maximum operating temperature. The engine is started and slowly accelerated to operating speed. Normally there will be one or more shaft criticals (resonant points exhibiting high vibration) during the accelerating period. Once these points are located, the engine can usually be operated at each critical long enough to obtain data from the CRO or indicating meters on the capacitance-probe unit. As an example, a maximum vibration reading may occur at 70 Hz. The displacement could be read directly from the CRO screen or the capacitance meter. It could also be converted directly into G forces in the manner outlined previously. Also at the maximum vibration point the minimum blade tip-to-shroud clearance would probably occur. This could also be determined from the CRO or indicating meter located on the capacitance-probe unit. In order to measure the maximum shroud growth due to a build up in temperature it would be necessary to operate the engine until conditions had stabilized. This point can be determined by a temperature-sensing device (thermocouple or similar probe) located near the point where thermal stress is being measured. By this means the operator is able to determine when the temperature has reached its maximum value. At this point, S1 is placed in the displacement position and the CRO input is switched to d.c. In this manner the d.c. voltage change will be indicated by a shift in the beam position directly proportional to any growth of the shroud due to the effects of temperature. These few examples, while somewhat simplified, should serve to indicate the versatility of capacitance probes for both static and dynamic measurements, as used in industrial instrumentation.